“Gilded cage?” Maybe it’s not where you think. There’s nothing quite as disappointing as seeing those who should get it — who by all rights should be your allies, your friends, your family — making silly and ultimately harmful observations. Especially when those observations add to a miasma of half-truths, stereotypes and unfortunate political leanings that are slowly and steadily choking education in this country. 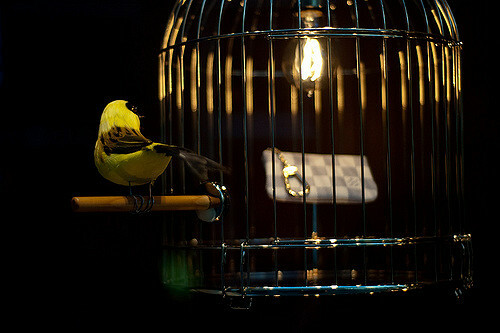 “Gilded Cage,” courtesy of KayVee.INC through Creative Commons. Starting the company, author Lindy Ledhowski wrote, was preferable to being caught in the “gilded cage” of a tenure-track and eventually tenured position. In such a position, she “would face no risks, but … be safe.” Now there’s a contrast whose supposed oppositions and subtleties I likely never will grasp. Ledhowski found it far more attractive to “make jobs for other people” than be in “a job.” The professoriate, she apparently believes, is an area in which “stasis” would be inevitable, at least for her. Personal ephiphanies are fine. When those are gussied up in the language of education’s most ardent enemies, it’s a little more problematic.